We got back from Texas City last night...and after Ryan left for work this morning, I started unpacking, and took a nap after. We slept really late the whole time we were in Texas City so I felt I really had to get some good sleep, so the supposed to be nap turned out to be an all-day sleep. Hence, I'm so late for my Monday post. But better late than never, right??!!! We've been to Texas City countless times already but for me, this last trip of ours is the most special of them all. Not only did we get the chance to spend time with Ryan's aunt's family again, we also got to join them in celebrating Ryan's cousin's birthday, and we got to see Ryan's cousin from British Virgin Islands whom we haven't seen for 5 years and also my brother's friend whom I haven't seen for more than 20 years. We didn't go out as much as we used to because of the hot weather (which is actually 10 degrees lower than the temperature here in DFW). We just stayed home most of our stay there but we all had a good time. 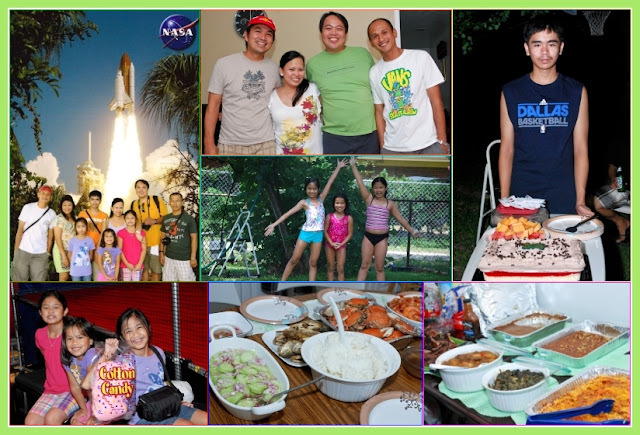 Indeed, nothing beats sharing stories and laughter with relatives and friends whom you don't get to see often! Getting a break for the continuous "above 100F" temperature here in Dallas is also a good thing! It's really very hot here in the Dallas-Fort Worth Metroplex, you know! It's actually the 38th straight day that we're having above 100F temperature. But even during hot days like this, nothing can stop me from having soup. I just love it, and finds it really comforting regardless of the weather. 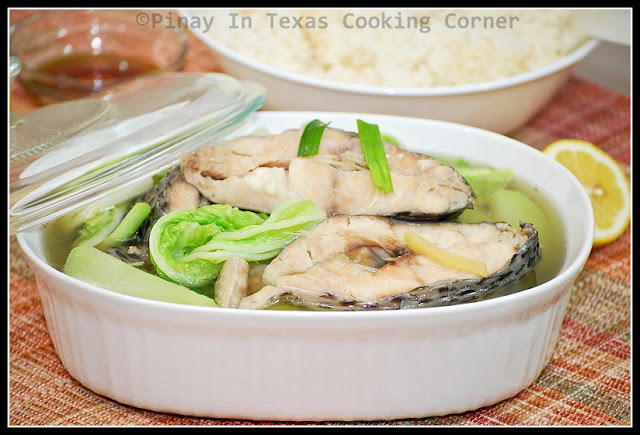 In the Philippines, there is this soup dish that I really love which is called Pesang Isda (Fish in Ginger Stew). 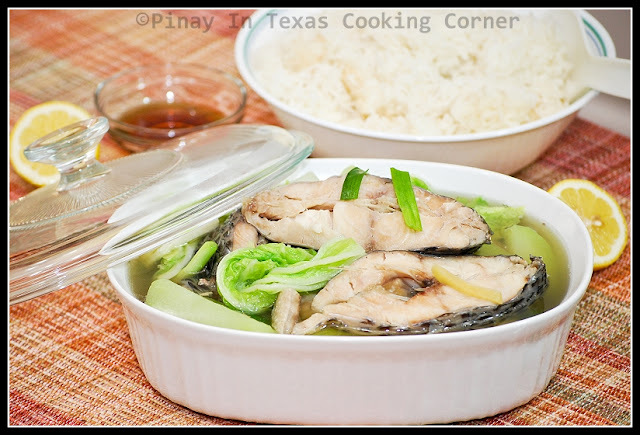 It is basically fish cooked in ginger broth with green leafy vegetables and sayote (pear squash). 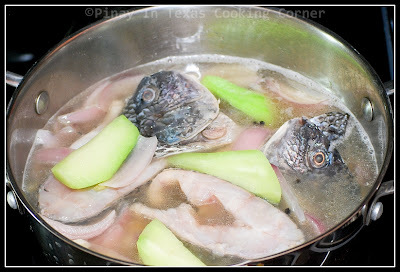 Lapu-Lapu or Miniata Grouper is the most commonly used fish for pesa in the Philippines. Cooking pesa differs from region to region. Some cook it with miso and some fry the fish first. 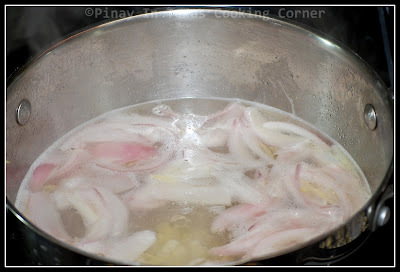 This version that I'm going to share with you is the traditional way of cooking Pesang Isda in Batangas but I used Tilapia due to unavailability of Grouper here in our area. This is one dish that never fail to make my daughters eat more rice than usual! All of us just love it! 1. Sprinkle tilapia with salt. Let sit in the refrigerator for at least 10 minutes. 2. 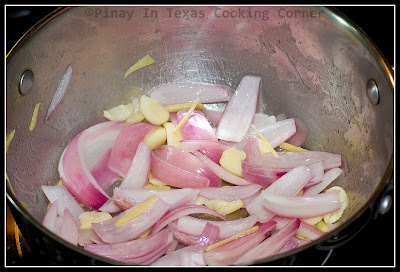 In a large saucepan over medium heat, saute garlic, onion and ginger in vegetable oil until onion is almost translucent. 3. Add water. Bring to a boil. Add fish sauce and peppercorns. Let simmer for 5 minutes to blend the flavors in the soup. 4. Add fish and sayote. Simmer for about 10 minutes or until the sayote is almost cooked. 5. 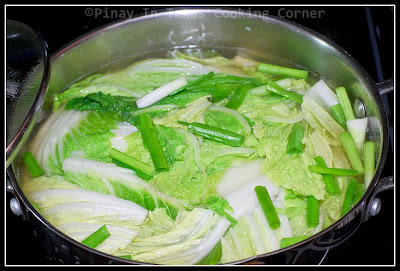 Add Napa cabbage and green onions. 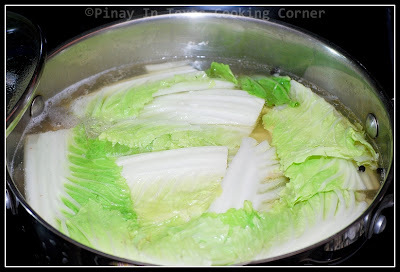 Simmer for about 3 minutes or just until wilted but still crisp. Perfectly light and flavorful seafood dish! Sounds so delicious. And it looks like you had tons of fun there too! How lovely! I adore tilapia! I love soups any time of the year, also!! This looks great. 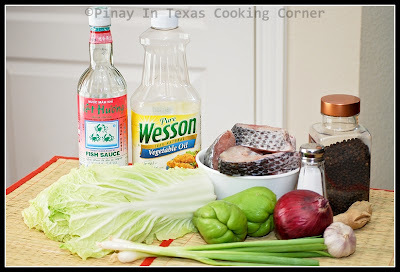 I have been in the mood for a fish soup recently and the flavor of ginger with it sounds great. Glad you had a nice trip! Thanks everyone for the wonderful comments! It's always nice to know that there are people out there actually reading my posts.